I absolutely love this elegant sophisticated ensemble. The emerald green satin is so beautiful. 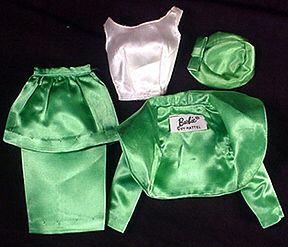 The jacket is the same pattern as the satin fashion pak jackets also from 1963 and 1964. This ensemble is fairy easy to find, with the hat being the hardest, as it was only made for one year. Also it can be a challenge to find a decent white blouse and the green shoes are among the hardest colors to find.